The cover tote is super cute and was made by the talented Ayumi of Pink Penguin. In addition to contributing projects, I also did some rounding up of contributors, and was excited that her tote made the cover. She has some amazing tutorials on her blog, too, so be sure to check it out. As for my projects, first up is this Row of Houses Pillow I designed for the Zakka story. I have been wanting to make one of these for a long time, and I thought this story was a good fit. I love simple projects that lend themselves to personalization, and this is one of them. 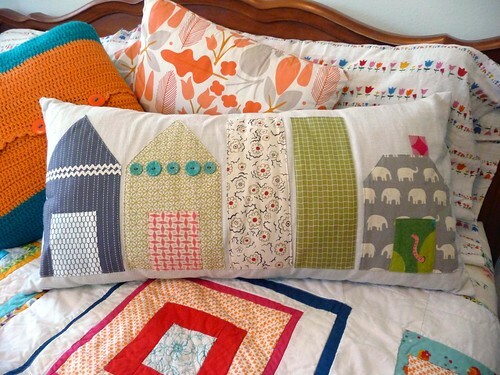 You just applique the houses to your pillow fabric, then sew up a case. I made the case removeable (as I always try to do) so that it can be washed or re-stuffed as time goes by. The fabric you choose for this project will dictate the style of the pillow– I can imagine it in folksy patterns or even solid colors. And of course, you can mix and match your house arrangement. It makes a nice pillow for a bench or your crafty guest bedroom (that’s where it is in my photo above). One of the things that I absolutely love about Stitch is that it really shows off sewing with all kinds of fabric, not just quilting cotton. I love cotton as much as the next person, but when it comes to garments, there really are some nice options out there. So even though the story Sheer Genius pushed me a little out of my sewing comfort zone, or maybe precisely because it was out of my comfort zone, I liked how this chiffon wrap came out. If you have a serger (I don’t), this would be a super speedy project. If you don’t, it’s still good practice for learning to sew with sheer fabric. The most time consuming part for me was finishing the edges (which is where the serger would have been real handy!) This wrap would be great for a semi- fancy holiday party or for travel- it squishes up to take only a tiny amount of space in your suitcase. I actually found the fabric I used for the wrap in the clearance section at Joann’s, making the grand total for fabric about $6. Good deal! The rest of the mag is full of great projects, many by bloggers you already know. I love the articles in Stitch as well–they have just the right balance of pretty pictures and really interesting information. This time around the focus is on global crafts and fabric, lots of fun! For more about what’s inside this issue, click here. Happy sewing! I have no idea what I was doing wrong but this time I am positive it will work. Sorry to keep bugging you! I put the wrong website for my blog on my last comment (I am pretty new to the blogging world). I wanted to correct it. I have been keeping up with you off and on via your blog for a while now. I am so jealous you got to move to San Antonio! I am from Dallas and have always wanted to move to SA. I currently reside in South Dakota--my first non texan winter! My hubby and I move around with his work. Congrats on the book! I love your work. 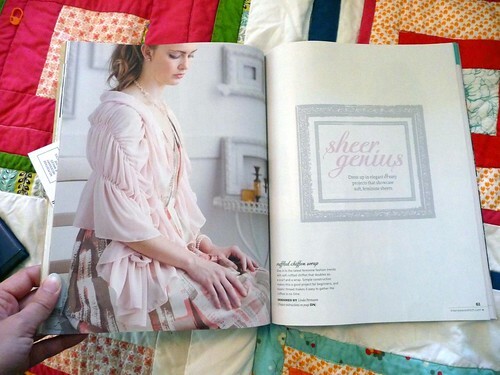 I am hoping to alot some time to make both of your projects from this issue of Stitch...both are darling! I'll be honest; I generally follow your blog for the crochet bits. 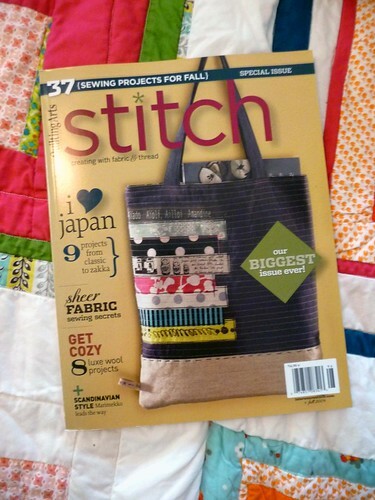 But I've been meaning to get back into sewing (my first craft), and your adorable pillow inspired me to pick up Stitch magazine for the first time. Just had time for a flip through, but I'm delighted and can't wait to pore over it! Thanks for your continued fabulousness!